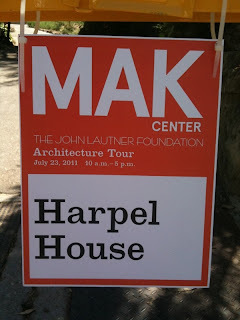 The next house I bring you from last weekend's Lautner Tour is the Harpel House. Nine years after the Jacobsen House, we can see that structure is clearly a major theme in John Lautner's work. Harpel displays his ongoing interest in developing a fully integrated and expressed structural system, for each project, as an important architectural value. The Harpel House is the white bar at the lower right. The octagon to the left is Lautner's famous Chemosphere, aka the Malin House. The small white circle just below the Harpel House is a Futuro which is apparently being restored by the Harpel's owner. We weren't allowed to photograph inside the house, so I'll give an exterior tour and describe a few things I liked about the inside, using the floor plan for visuals. 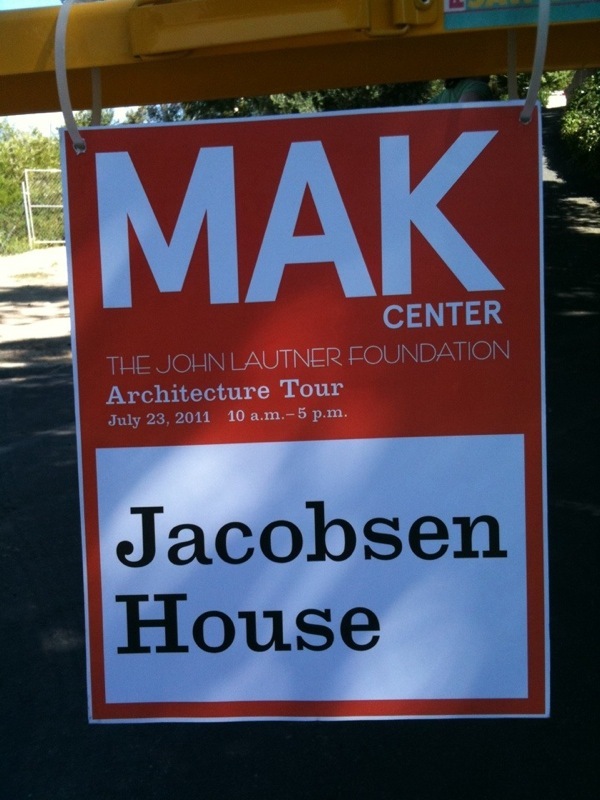 Last weekend I had the wonderful treat of participating in the special tour of John Lautner-designed homes that was jointly put on by the MAK Center and the John Lautner Foundation. The whole thing was done in celebration of what would have been Lautner's 100th birthday on July 16th of this year. I present them here in the reverse of the order in which I saw them on the tour, for a couple of reasons. First, by reversing the order, I will roughly present them in a chronological sequence from earlier career to later, which I think makes sense with this particular group of projects. Second, it makes little sense to lead with Sheats/Goldstein, since everything is pretty much anticlimactic after that. One more introductory note: the MAK and Lautner folks who organized the tour did a great job, and produced a booklet for the tour with information about the houses. In my blog posts in this series, all the images are my own photographs, with the exception of one or two archival photos from the booklet, and the Lautner drawings which I scanned from the tour booklet. The Jacobsen is on Multiview Drive, just below Mulholland Drive, overlooking the San Fernando Valley above Studio City and Universal City. Multiview is a pretty good street for architecture; Schindler's wonderful Kallis House, with its butterfly roof and quirky stone fireplaces, is nearby on the same side of the street. This is an early-career project for Lautner, dating from 1947. According to Wikipedia, he had left Frank Lloyd Wright's employment and gone off on his own by that time, although he did not finally obtain his own architecture license until 1952. So, this house is the work of an unlicensed individual who would have found himself in violation of California law had he have claimed to have been an architect. Ahem. Don't get me started. I had a look at Curbed LA this morning to see if there was anything on there about the Lautner Tour, and I wasn't disappointed! 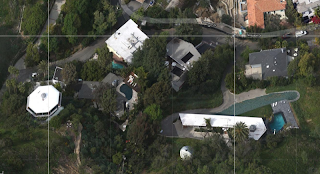 Earlier this week they posted a neat little video of appearances by Lautner homes in movies. It's good fun, and they even included the sort-of appearance of the Chemosphere house on the Simpsons. Two houses from the tour are shown here, the Jacobsen and Sheats/Goldstein houses. They have more info about the houses in the video over at Curbed. I may even throw in some good stuff that's not even part of the tour! 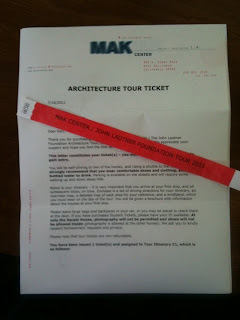 I'm very excited about the tour I'm participating in tomorrow, of 4 private homes designed by the great modern master John Lautner. Twitter: follow me at twitter.com/Earl3d for updates with links to photos. Tumblr: Check out my new Tumblr blog for photo updates throughout the day at earl3d.tumblr.com. I'll be posting the same updates to all 3 sites simultaneously, so don't feel like you have to keep track of all 3. The Tumblr blog is going to be a bit of an experiment for me. Thus far, I'm thinking of it this way: Creatures of Prometheus is going to remain my primary blogging outlet for more thoughtful analysis, carefully written essays, photo essays, and the like; whereas I'll use the Tumblr blog for briefly captioned mobile uploads and live-tweeting (live tumbling?) or live-blogging of events that will benefit from lots of photography. I also plan to take my trusty Nikon D-90 on the tour and get lots of 'good' photos of the houses too, and write up separate blog posts for each one, as I described the other day. One thing that throws a little wrench into this plan is that they have forbidden any photography at the Harpel House. Perhaps they will allow some exterior photography there. In any event, I can bring my sketchbook. Also, the Schindler House on Kings Road will be open all day, with free admission for tour-goers, so I'll likely stop by there after the tour, on my way home. That should be a great way to decompress, collect my thoughts, and contemplate the events of the day. 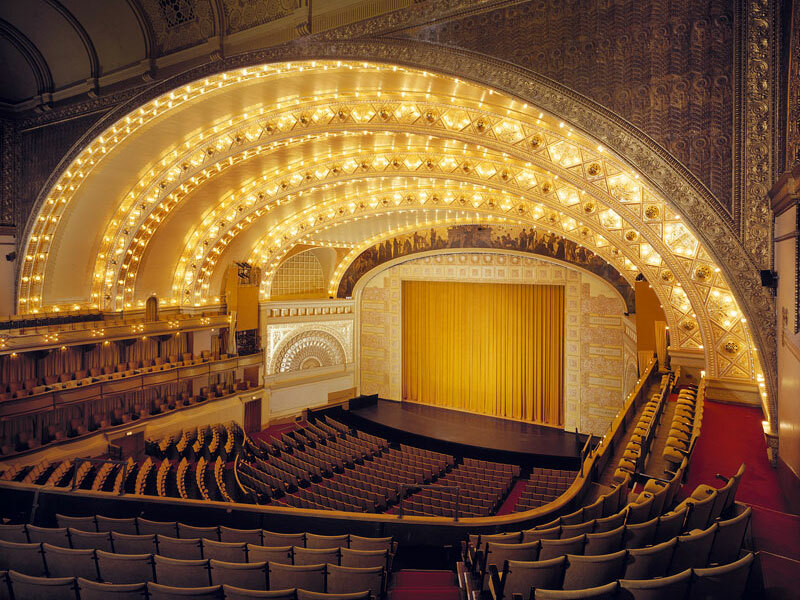 In the period of a few years between 1887 and 1889, a 30-year-old Louis Sullivan, aided by his 18-year-old assistant Frank Lloyd Wright, conceived and built the Auditorium Building at the corner of Michigan Avenue and Congress Parkway in Chicago. The building is a tour-de-force of Sullivan's genius, and is generally considered to be among his greatest works. I'm thrilled to be presenting a special tour of the building as part of the Chicago Objectivist Society's MiniCon, this coming Labor Day weekend. The Theatre was (and is) renowned for its acoustical perfection, among other technical innovations that amazed theater goers when the building was new. 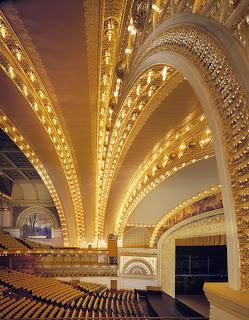 It was the first building to employ a system of central air conditioning, the first to be lit exclusively with incandescent light bulbs, and and it is often cited as the first mixed use building, as it contained not only the Auditorium Theatre, but also a hotel and rental office space. When most people (of those who are aware of it) think of the Auditorium Building, I would venture to guess that their minds typically go straight to the Theatre, and rightly so. The Theatre itself is the crown jewel of the building, after all. But, there is a lot more to the Auditorium Building than just the famous Auditorium Theatre. It's a horrifying development that one of the themes of the Summer of 2011 is the ongoing war being waged by local municipalities all across the US against kids and their lemonade stands. It's a regular occurrence to see outraged links to these news stories in my twitter and facebook feeds. When NPR has an opinion piece in favor of the right to earn an honest living–let the kids have lemonade stands!–you know the statists went too far. If lemonade stands are symbols of the American dream, and if lemonade stands are under attack in the United States, then the American dream is under attack. The ongoing erosion of Property Rights. A person has the right to use & dispose of his property as he sees fit, provided he does not violate the rights of others in so doing. If a person wants to invite others onto his front lawn for the purpose of selling them lemonade, its his right. For the police to show up, and prevent this harmless activity from taking place, is pure thuggery. The police officers who enforce these laws should be ashamed of themselves, and don't give me any of that 'he's just doing his job' crap. The police officers who enforce these laws should be ashamed of themselves. Attack on individuals' Right to Earn a Living. Ever heard of Life, Liberty, and the Pursuit of Happiness? Ever thought about what that really means, in a practical, nuts-and-bolts way? I think most people hear this well-worn phrase and picture, in a very lofty and abstract way, that America was founded as the place where you could follow your dream and do whatever you want to with your life. This is certainly true, but try thinking about it in a more concrete way. How about: A person has a moral right to earn an honest living by the means of his own choosing. A person has a moral right to earn an honest living by the means of his own choosing. Of course, this concept has been completely turned on its ear these days. The slew of regulations, at multiple levels of government, that act as barriers to entry for new businesses don't just prevent new businesses from opening. They kill peoples' dreams. They prevent people from earning an honest living by the means of their own choosing. If you think that those regulations are actually necessary to prevent people from harming each other, I would refer you to point #2 above. The vast majority of regulation today is simple denial of the Right to Contract in the interest of furthering some political ends. I think that formulation deserves a Big Font, too. The vast majority of regulation today is simple denial of the Right to Contract, in the interest of furthering some political ends. I think that today, the most critically abused aspects of Individual Rights are these three. The War on Lemonade Stands is a horrific encapsulation of what goes on every day, at all scales, when government oversteps its proper role of protecting our rights, and instead becomes the violator of our rights. Although the Tea Party movement had its origins in a reaction to government abuses not unlike those described above, I and many others fear it will be (or has been?) co-opted by the Religious Right and their anti-Individual-Rights social agenda. Of course, the only real way to combat government intrusion is a robust, moral defense of Individual Rights, which the Tea Party has yet to embrace, and which is largely antithetical to any mainstream political thinking today. I say forget the Tea Party, let's start the Lemonade Party! And while most appeals to take action 'for the children' make me retch, this is one I could actually get behind and advocate for. It looks like it's on! Turns out that Judy over at Consent of the Governed wrote this piece with much the same sentiment, and suggested August 20 as Lemonade for Freedom Day. Robert Fernandes has created a website called lemonadefreedom.com and facebook event page, and word is getting out. This is great! It's good to stop what you're doing periodically and review the positive accomplishments in your life. A couple of months ago I posted on how I was finally feeling back to my old self after a period of months of unforeseen setbacks and troubles. Well, as it turns out, it wasn't as easy as just 'snapping out of it' and going back to my previously robust self. There have continued to be good days and bad days. But, overall, I've managed to gain and/or keep the upper hand for the most part, and the stock chart of my life has, in fact, continued in a generally bullish trend. Now that the year is slightly over half over, and lest anyone (I'm mainly talking about myself here) think the first 6 months of 2011 were a wash, I want to stop, take a timeout, and acknowledge some of my actual positive accomplishments from the first half of the year. Where was I? Oh, that's right. My actual positive accomplishments from the first half of the year. Periodically, I sit down and avail myself of the Googles and Wikipedia to find birthdays of great architects and designers I admire. I add them to my calendar, with the intent to blog my own little celebrations of them as they roll around throughout the year. If you have any suggestions for me to add to the list, please feel free to chime in, in the comments. There haven't been any for a few weeks now (of the ones I've added to my list thus far). Today we have a big one to celebrate. Today marks the Centennial of John Lautner's birth. Lautner was one of Frank Lloyd Wright's more illustrious proteges, and has a special place in my personal Pantheon. Lautner wasn't just another good architect. He was an incredible visionary and innovator. Rather than go on at length about Lautner's career, as the Wikipedia article linked above does, I'm keeping it short today, but don't worry, there's much more to come. This summer, the John Lautner Foundation is holding a whole series of events to celebrate, including a tour next weekend of private Lautner homes in the L.A. area. 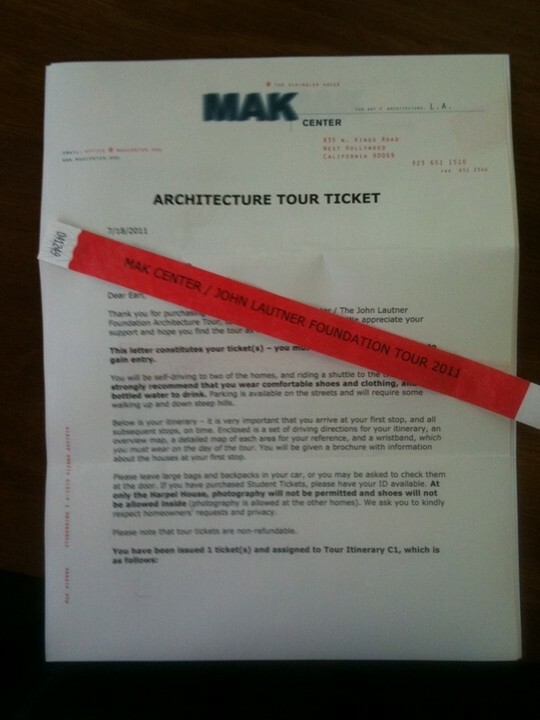 I bought my ticket this morning, and couldn't be more excited. The tour is a little pricey at $100 but worth every penny, IMO. You can get yours here. Join me for the tour! I'll have my camera with me and expect to take lots, and lots, and lots of pictures. I plan to do a separate post for each house on the tour. The tour includes (links are to Google image searches for each house) the Harpel House (1956), Jacobsen House (1956), Schwimmer House (1982) and Sheats/Goldstein House (1963/1989). Stay tuned! And raise a glass to the genius of John Lautner today!